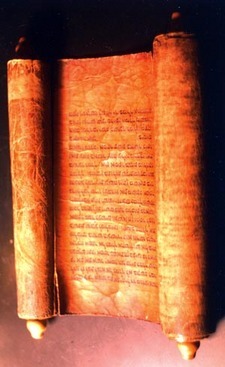 Scrolls, after a lengthy and venerable history, disappeared with the crumbling of the Roman empire, to be replaced in late antiquity by the paged, bound and covered book, or codex. Books were more portable, easier to read and easier to store. End of story for the scroll, right? Well maybe not. I like to follow developments in new technologies that could one day impact the way we read books. Two such technologies that has seen steady evolution over the last decade are electronic ink and flexible transistors. Grayscale electronic ink works by by incorporating black and white pigment chips in fluid filled microcapsules and placing the capsules between two charged electrodes, the upper electrode being on a transparent substrate. By changing the charges on the electrodes, the pigment chips can be made to rise or fall in the microcapsules, thus producing black or white pixels on a screen. E-Ink, one of the companies pioneering electronic ink, recently announced a new color electronic ink technologybased on the use of photonic crystals. Photonic crystals have been the target of intense research, primarily for their potential in light based computing. They were inspired by the structures that produce natural iridescence in butterfly wings and abalone shells. (See The Gecko’s Foot by Peter Forbes for an excellent description of this technology.) The company has also increased the frame refresh rate of the display from one frame per second to 30 frames per second, which makes it possible to display video as well as static text. The other developing technology is flexible transistors, which are making possible displays which can be shaped in all sorts of ways – e.g. as curved signage. Because the displays are flexible, they can be rolled up like scrolls. Engadget showcased E-ink’s new e-paper displays in a recent article. A combination cell phone and e-book, with a roll up display, called a called a cellular book, has been shown by Telecom Italia and Polymer Vision. The approach of using a roll up display gets around the small screen problem for cell phones with pretensions to being full blow mobile computers. Pull out the screen to get a comfortable viewing surface and then roll it back up when you are done. The screen is certainly large enough to allow book text to be read comfortably. And the device is certainly portable, with plenty of storage capacity. Perhaps, after almost two millennia is retirement, the scroll might be making a comeback. This entry was posted in open publishing, publishing technology and tagged e-book, e-ink, e-paper, flexible display, scroll. Bookmark the permalink.